Clarence Little, director at the Hyde Park Learning Center, was selected this month to receive a Schott Fellowship in Early Care and Education. He was chosen as one of 11 fellows statewide. The award is given to support a diverse group of senior leaders in early childhood care to strengthen public policy for the children of Massachusetts. The year long Fellowship program is design to develop a cadre of senior leadership and engage new people, organizations and communities in the universal early education movement. 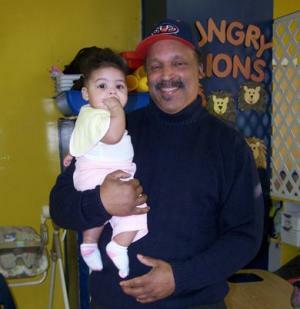 Little, a member of the Innercity Network of Early Education Professsionals has been in the field for over 32 years. "I started off in this business in college," Little said. "Soon after I got a job at Putnam [childcare] my parents started the Hyde Park Learning Center, and here I am." Little said he developed in his career studying behavior modification in groups as well as serving as an aide to psychologists. "It interested me, so I went back to school for [child psychology]," he said. At the Hyde Park Learning Center, Little runs child programming, servicing children from three months to six-years-old. "We offer a creative curriculum and have breakfast, lunch and snacks," he said. Little said the center is funded privately and through the state. "We mostly teach the kids how to get ready for school and anything we can help with." "[The Schott Fellowship] means that I'll have a great network to connect to the people in this field," Little said. "This also means that I've been recognized for my work, I've put a lot into this." Little added that he hoped the fellowship would also help influence policy in the early education field and possibly bring in some more funding for the center. According to the Schott Fellowship, winners are provided an opportunity to learn and practice policy skills such as how to identify policy gaps, collect and analyze data, work collaboratively to develop policy solutions, frame an issue and facilitate community dialogues. Fellows are leading their organizations to become more involved in the policy process. Through policy dialogues and sharing their fellowship learning, they mobilize staff, board members, and clients to take a greater interest in policy solutions and to consider how they can improve their own policies and procedures to better support children and families. Fellows also research policy gaps, and develop solutions to address these gaps including regulations to ensure that early educators receive training to increase their cultural competence, quality standards that apply equally to all programs that serve young children and program practices and training that actively encourage family involvement and support. Little said, since he opened the center about eight years ago, there has been a new focus on early education. "I'd say, actually in the last 10 years, there has been a shift towards professionalism and teacher education," he said. "We want to continue down that road here." As toddlers ran around, playing with toys and intermittently screaming, Little laughed as he explained why he got involved with early education so many years ago. "Everyday is different," he said. "These kids keep me young and invigorated. Watching them is great. I've always loved kids, but it's also about helping the parents out, so they can go out and provide for their kids." Over the 30-plus years, Little said he's seen kids he once watched over, come back into the center with their children. "I've seen kids come back in with their own kids," he said. "This is a job with a very real impact on people's lives, not just the kids, but everyone," Little said. As a result of the fellowship, Little said he may consider running for public office. "It may lead to that," he said. "Something local, like city councilor or representative, we'll see where it leads."